Breakout board for the Analog Device ADXL345. The ADXL345 is a small, thin, low power, 3-axis accelerometer with high resolution (13-bit) measurement at up to ±16 g. Digital output data is formatted as 16-bit twos complement and is accessible through either a SPI (3- or 4-wire) or I2C digital interface. The ADXL345 is well suited to measures the static acceleration of gravity in tilt-sensing applications, as well as dynamic acceleration resulting from motion or shock. Its high resolution (4 mg/LSB) enables measurement of inclination changes less than 1.0°. This diagram is an IIC connection method suitable with Arduino UNO. 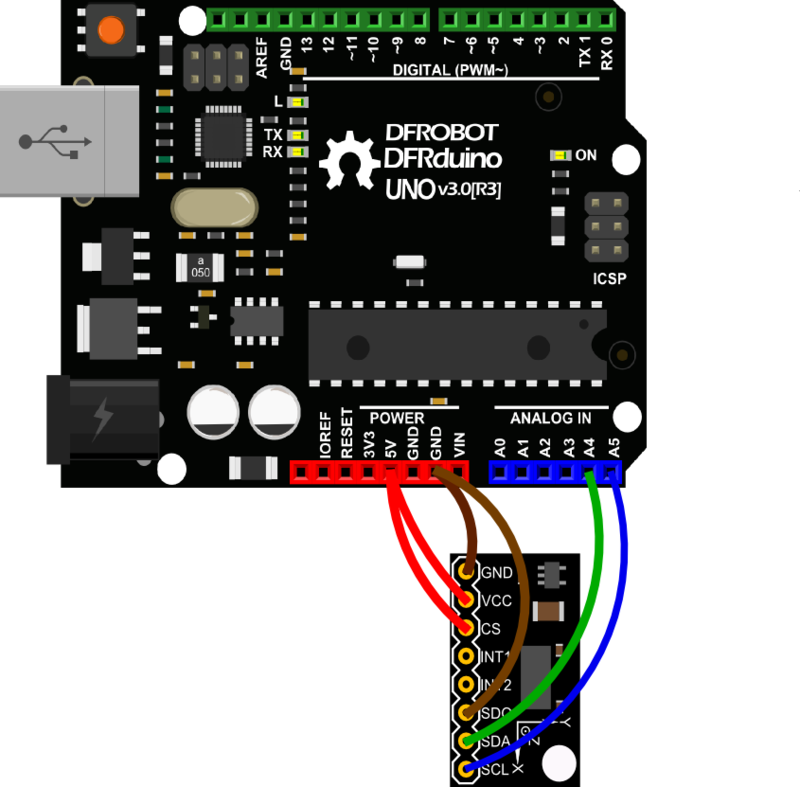 It would be differen if you use other Arduino Controllers which the SCL & SDA pin might be different. And if you want to use SPI interface, please refer to ADXL345 datasheet for more info. Upload the sample sketch bellow to UNO or your board to check the 3-axis acceleration data and the module's tilt information. By the way, we have collected some useful 3-axis data processing methods: How to Use a Three-Axis Accelerometer for Tilt Sensing. 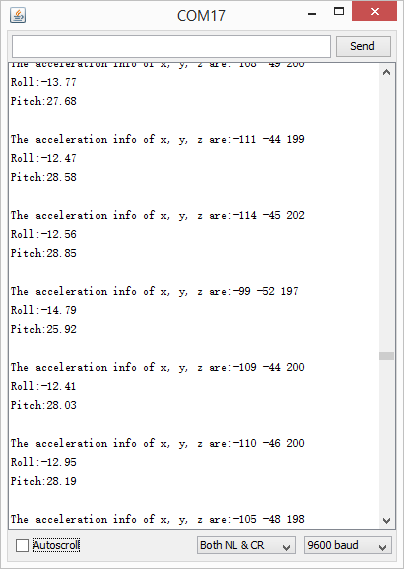 Open the Serial monitor to see the 3-axis acceleration data and Roll-Pitch angle. See changs as you sway the Accelerometer. 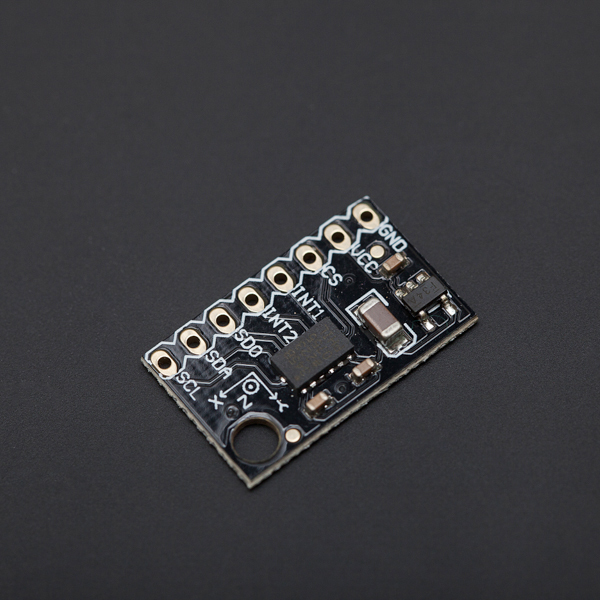 Get Triple Axis Accelerometer Breakout - ADXL345 (SKU:SEN0032) from DFRobot Store or DFRobot Distributor.